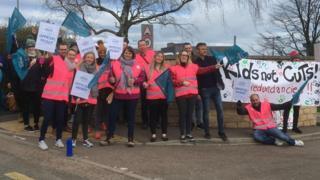 Dozens of teachers, students and parents joined a picket line to protest against the proposed closure of a school's sixth form. Up to seven teachers could also be made redundant at Bradfield School in Worrall, Sheffield. Ben Miskell, a teacher and National Education Union (NEU) official, said people were "angry and frustrated". The school said it needed to close the sixth form because recruitment had been low for several years. In a statement, school leaders said they were in the consultation process and doing "everything to mitigate against compulsory staff redundancies", including flexible and part-time working. The NEU said the closure should be reviewed and other options considered, such as sharing a sixth form with other local schools. Mr Miskell said: "We're worried that cuts to the workforce will have a detrimental effect on the young people in our community, at a time when the school has taken the decision to increase its leadership by 100%." In a statement the school said it was "disappointed and very sad" about the strike action. "The governors had to take a very difficult decision to close the sixth form because recruitment has been very low for a number of years which has made it unviable and in a deficit position," it added.